Rossella Rago, right, with her mother and Nonna Romana. 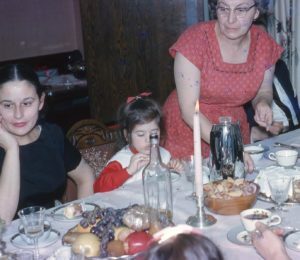 A young Adriana Trigiani, center, with her mother and grandmother, Viola. 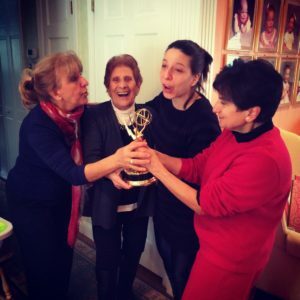 Mickela Mallozzi with, from left, her mother, Nonna Giuseppina, and Zia Maria celebrating one of her Emmy Award wins. 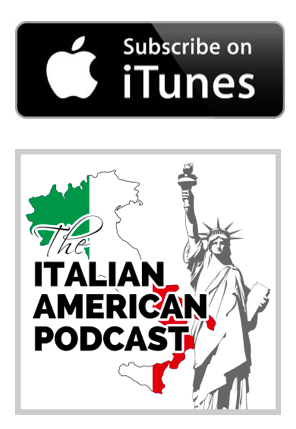 In our 40th episode of The Italian American Podcast episode, we wanted to do something special for Mother’s Day. We talk to some of our past guests, all very proud Italian American women, and discover what their mothers did and believed in as they grew up and also what it meant to them back then, and today. Dolores and her mother in Italy. In our Stories Segment, we talk about the deep connection to Italy for Italian Americans and what our ancestors had to go through in life to get where they are today. We also introduce a new venture we’re embarking on with Cassandra Santoro of Travel Italian Style to help you visit your ancestral towns. 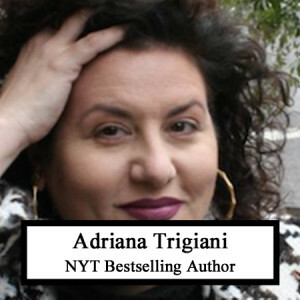 Adriana Trigiani is beloved by millions of readers around the world for her bestselling novels, including her latest, All the Stars in the Heavens, the instant bestseller of The New York Times, Barnes & Noble, Publishers Weekly, USA Today, and Indie Booksellers nationwide. She wrote the blockbuster The Shoemaker’s Wife, the Big Stone Gap series, the Valentine trilogy and Lucia, Lucia. Trigiani’s themes of love and work, emphasis upon craftsmanship and family life have brought her legions of fans who call themselves Adri-addicts (a term coined by book maven Robin Kall). Their devotion has made Adriana one of “the reigning queens of women’s fiction” (USA Today). Her newest novel, Kiss Carlo, will be available wherever books are sold on June 20th! The New York Times calls her “a comedy writer with a heart of gold”, her books “tiramisu for the soul.” Her books have been translated in 36 countries around the world. Adriana has toured many of the countries, including South Africa, with annual visits to the United Kingdom. Adriana wrote and directed the film adaptation of her debut novel Big Stone Gap, produced by the Academy Award winning producer Donna Gigliotti, shot entirely on location in her hometown, with an all star cast including: Ashley Judd, Patrick Wilson, Whoopi Goldberg, John Benjamin Hickey, Anthony LaPaglia, Jenna Elfman, Jane Krakowski, Judith Ivey, Mary Pat Gleason, Dagmara Dominczyk, Mary Testa, Paul Wilson, Chris Sarandon, Jasmine Guy, and introducing Erika Coleman and Bridget Gabbe, with music by John Leventhal, and songs performed by his lovely wife, Rosanne Cash. Glorious local talent perform on the soundtrack and act in the movie, sharing their gifts beyond the peaks of the Appalachian mountains. The soundtrack is now available on iTunes and in stores. Rossella is the host of the online cooking show and food webisode series, “Cooking with Nonna” and the recent winner of the Food Network – 24 Hour Restaurant Battle – Battle Italiano. Rossella is a first generation Italian-American from Bensonhurst, Brooklyn where she was born into a family of culinary aficionados and food lovers. Her deeply rooted heritage finds its source in Mola di Bari located in the Puglia region of Italy, a small fishing village more commonly referred to simply as Mola, where her parents were born. Rossella spent most of her childhood in the kitchen with her maternal Grandmother Romana learning the long legacy of recipes passed down through the generations for centuries. Both the passion for her parents’ native language and her experiences in high school propelled her to choose Italian as her concentration in college. In the spring of 2009 she graduated from St. John’s University with a Bachelor of Arts degree in Italian Literature. She is fluent in both Italian and her native dialect of Mola di Bari. Rossella has also completed an intensive program at the Natural Gourmet Institute in New York. 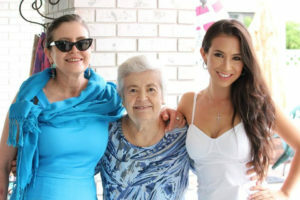 Inspired by her love of food, her passion for entertaining and acting, as well as her love for her family and community, in 2009 Rosella launched the “Cooking with Nonna” show, which features recipes passed down throughout the generations that are simple to make, delicious, and rich in their history. 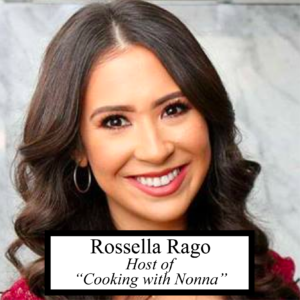 In addition to inspiring grandmothers from around the world to pass down their sacred recipes, entertaining audiences with her show, and popularizing authentic Italian cuisine, Rossella plans to raise awareness and promote healthy eating habits for young women everywhere. Her goal is to be a positive role model and inspire young women worldwide. Mickela was born and raised in Stamford, Connecticut of Italian immigrant parents from Minturno (Lazio region). Growing up with well-preserved traditions of the Southern Italian culture, her appreciation for folk tradition started at a very young age. She began dancing when she was three years old and soon started playing the piano at age five. Her love for the arts flourished, was trained in classical and jazz piano, played violin and flute, trained at the Stamford City Ballet school and Center Stage Dance Studio, and was choreographing and performing with prestigious companies in the tri-state area once she reached high school. In college, Mickela attended New York University for Music Composition, studying abroad for two summer semesters through the NYU Florence Program and as an AIAE Programma Ponte scholarship recipient in Rome in 2003. Studying abroad sparked a love for travel in Mickela back in 2002 that has since then influenced her career. Out of college, Mickela worked in the music industry, eventually landing a position with one of the top music management companies, Sanctuary Artists. Working for one of the industry’s top metal bands, Slipknot, she realized that arts were no longer in her daily life as they had once been. Quitting the music industry entirely, she went full force back into dance, teaching jazz, tap, ballet, and lyrical at the Locust Performing Arts Center in Stamford (artistic director, Jimmy Locust) as well as The Masala Bhangra Workout® at The Ailey Extension in New York City.